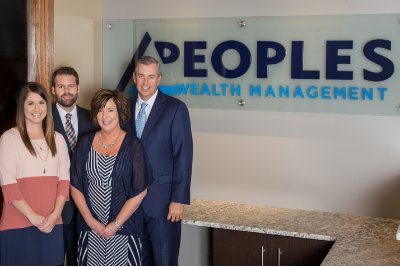 "Managing Your Wealth, Protecting Your Future"
At Peoples Wealth Management, our experienced investment professionals take a hands-on approach when it comes to the investment planning process. We strive to provide comprehensive guidance, up-to-date information, and exceptional customer care in every stage of our client’s goals and objectives. We place a major emphasis on educating current and upcoming retirees on how to protect their assets, organize, and create a plan by utilizing tax advantage strategies and considering time horizon and lifetime needs. For clients considering retirement, we assist in preparing and developing a multi-level retirement approach. This includes pre-tax, after-tax, and tax free portfolios for a more tax efficient distribution plan and addressing estate planning concerns for life’s unexpected events. For our retired clients, we focus on tax efficient income distributions, along with wealth preservation. We work with successful clients that are interested in holistic planning, realizing that investments are only a part of the conversation. Our office takes pride in developing long term relationships with our clients and their other trusted professionals, such as their CPA or attorney, to develop a plan for accumulation, preservation, and wealth transfer. Let us help guide you toward a worry and stress-free retirement! This communication is strictly intended for individuals residing in the states of CO, FL, IA, IL, IN, MO, NC, OR, WI. No offers may be made or accepted from any resident outside these states due to various state regulations and registration requirements regarding investment products and services. Investments are not FDIC- or NCUA-insured, are not guaranteed by a bank/financial institution, and are subject to risks, including possible loss of the principal invested. The financial advisors of Peoples Wealth Management offer securities and advisory services through Commonwealth Financial Network®, member FINRA/SIPC, a Registered Investment Adviser. Peoples State Bank is not a registered broker-dealer or Registered Investment Adviser. Peoples State Bank and Commonwealth are separate and unaffiliated entities.